Summer Snow is lost. When she calls off her engagement, she knows it’s the right thing to do. There was never a spark, a real connection with her fiancé. But will she ever experience that? Feeling the need for comfort, she visits her granny who gives her more bad news. Summer’s granny’s health is failing and her beloved Granny, who is her last remaining relative will not be around much longer. Granny gives Summer a list of things she wants her to do to try and find herself instead of taking care of her. The first thing on that list is to find her childhood friend, Martin Langtree. As Summer and Martin cross items off the list, their friendship picks up right where they left off twenty years ago. But is there a possibility for more than friendship? While reading this book, I kept expecting more. More what, I’m not sure. More conflict or more mystery perhaps. This story was pretty straightforward. Martin and Summer and polite to the extent of annoying, and they both seem almost too perfect. The romance is too straightforward. Probably the best part of this story was the struggle between Martin and his brothers (and that dynamic could have been explored more). All in all, the book was so-so. Not something that will stand out as exceptional or memorable. ****Moody Publishers provided me with a complimentary copy of this book via NetGalley. All opinions expressed are my own. I had never heard of Katie Ganshert before reading A Broken Kind of Beautiful (which I still think is the best ever title of a book). After reading that book last year, I devoured her other two books and have been anxiously awaiting the one I knew she has been working on. 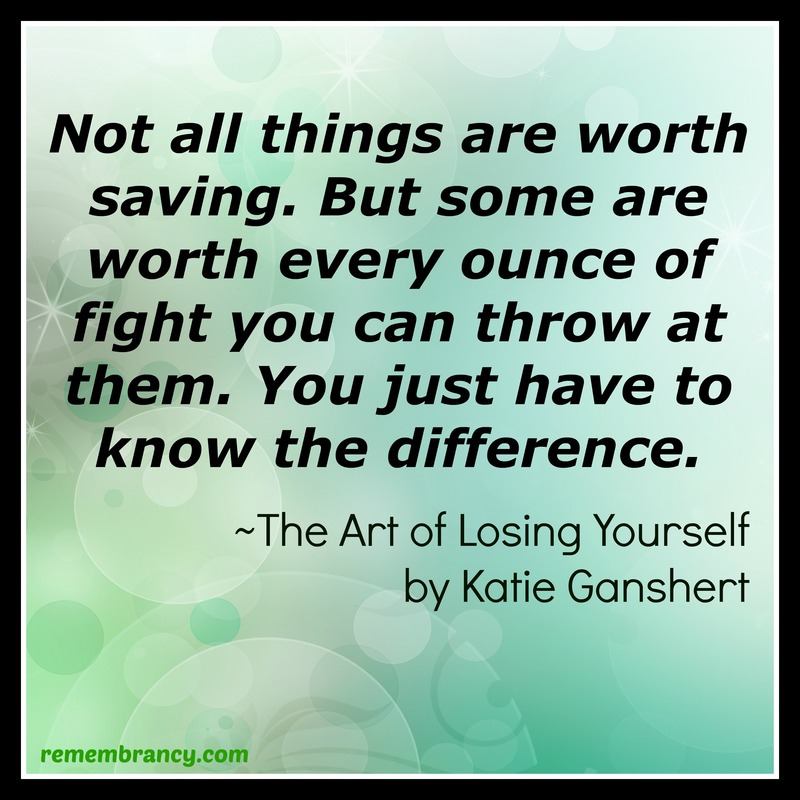 The Art of Losing Yourself was worth the wait. After an incriminating video goes viral, local meteorologist Carmen Hart is required to take a leave of absence from the television station where she works. Carmen lives two lives—the perfect, painted on version in which she is happily married to the local high school football coach, loves her job, and attends church every Sunday and the one where she is drowning in so much sorrow and pain she doesn’t know how to climb her way out. When local authorities call Carmen about a trespasser at her aunt’s abandoned motel and she drives out to find her half-sister. Gracie’s presence is a struggle for Carmen both because she feels guilty for abandoning her with their alcoholic mother and because she wants to break through the walls Gracie has built around herself. Ganshert’s tale is told through both Carmen’s and Gracie’s points of view, which allows the reader to take this journey along with each sister. Carmen is broken, and you hurt for her in her suffering while at the same time wanting to shake her until she opens up to those around her who love her. I loved Gracie’s acerbic sense of humor and several of her comments or thoughts made me laugh. But this story is truly about healing. Healing relationships, healing past hurts, and healing from God. Ganshert digs deep, opening some emotional wounds in each of her characters that bleed. Wounds that require more than a bandage and a kiss to make it better. My only objection to the story? I didn’t want it to end. I want to spend more time with Carmen Hart and Gracie Fisher. Want to learn more about the author? Visit Katie Ganshert online. ****Blogging for Books and Waterbrook Multnomah provided me with a complimentary copy of this book in exchange for an honest and fair review. All opinions expressed are my own. If you’ve been reading the Chapel Springs series, you are at least a little bit away or Ryan McKinley’s history with his ex-wife. The fourth and final installment in the series not only gives you the complete picture of what happened in Ryan’s marriage, it also introduces you to some new people who will be in Hunter’s next series (the first book in the Summer Harbor series is currently slated for a September release). Ryan McKinley has spent three years trying to get over his ex-wife, and his family has not been shy in their opinions either. Moving into her dream house had been a mistake. When he receives a call from Abby’s parents about an anniversary party, he realizes that she hasn’t told them about the divorce. Deciding this was a sign that he should reconcile with her, he shows up at her door to make the drive with Abby and spend a couple of days with her parents. Abby has moved on with her life after Ryan. The last year of their marriage was filled with arguments and fights. At one time Ryan had loved her but then he seemed to resent her. But spending time with him—in close quarters no less—is playing havoc with her emotions as well as her resolve. Why does he insist on wedging himself into her trip, her family, and her life? Why can’t her heart let him go? While Ryan states several times during the book it took two people to break up their marriage, Abby’s distorted view of how she should be treated is the crux. Her family dynamic made me both angry and sad. With the scars from her past, her view on relationships is skewed. But Ryan is set on convincing her he’s worth the risk. 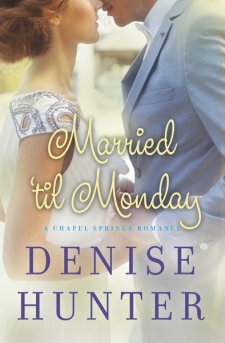 I enjoyed the first book in this series immensely, but Married ‘til Monday was my favorite as I walked the road to healing with Abby and Ryan. ***Booklook Bloggers and Thomas Nelson provided me with a complimentary copy of this book in exchange for an honest and fair review. All opinions expressed are my own. Guess what? 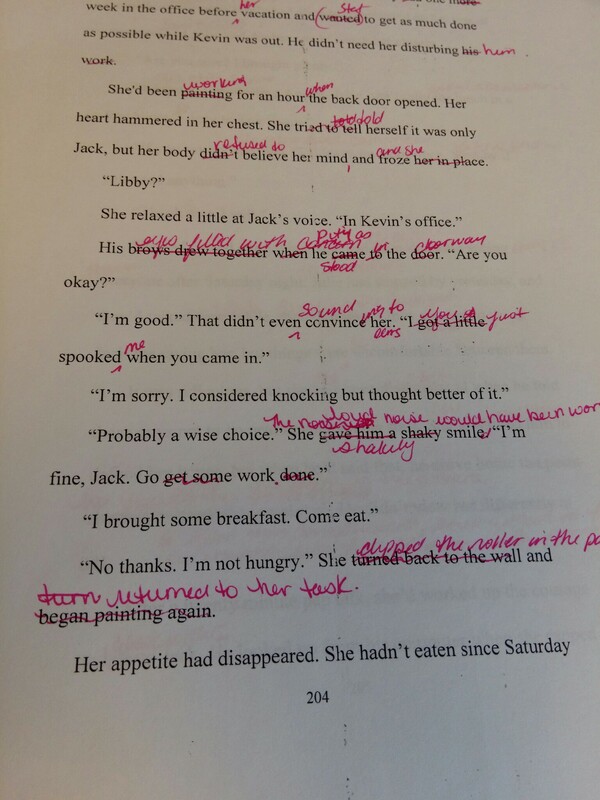 I’m still slugging away on edits for my fourth book. I made some pretty good progress this weekend while I was watching a friend’s dog. Her husky doesn’t try and sit on my lap like my little rat terrier does. Roxy does not like me working on my laptop because it means she doesn’t get lap time. Oh well, we all have to sacrifice. So anyway, I’m up to chapter 41 in edits and have a little more than 100 pages to go. I’m hoping to get it under 100 before Friday since I’m going camping over Memorial Day weekend and won’t be able to work much there (although I may still take a hard copy to write over). Speaking of which, here’s a page of my edits from last week. By the way, when I was writing this series, I did have an idea for a fifth book, but as I came to the end of Beauty from Ashes, I felt like it was a nice wrap up to the series. Readers who have read the other three books will get to catch up with all of the couples they’ve gotten to know as they read Libby’s story (if you read Pursued, you know that Libby is Callie’s sister). No spoilers for you this week, though. Sorry, I’m in the middle of a pivotal scene and I don’t want to give anything away. Perhaps next week I’ll have a snippet for you. This debut novel from Rachelle Dekker leaves an impression. A good one that leaves the reader wanting more. Yes, she is related to that other best-selling author with the same last name. Rachelle is Ted Dekker’s eldest daughter. After reading several comments on Facebook and Twitter that read something like “If you enjoy Ted Dekker’s work, don’t miss Rachelle Dekker’s debut.” These comments left me wondering what I would be reading. While I enjoy most of Ted’s books, I also know they are intense, dark, mind-boggling, and sometimes downright scary. They take a little more commitment to read than the romance novels I breeze right through. I’m happy to report that Rachelle put just enough of this in her book to make the story move along without bogging the reader down. But more about that later. Carrington Hale has trained her entire life for one thing. One evening will determine her future. When the evening doesn’t go as planned, and Carrington is not chosen, she is whisked away to a lifetime of service as a Lint. 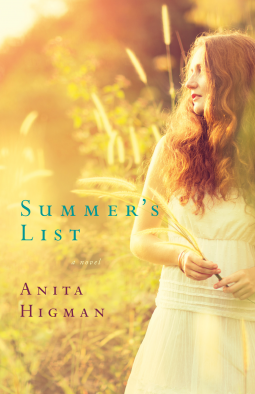 Reeling from the abrupt changes in her life—the loss of her family and the life she’s known, living with a large group of other women, and working—she forms a tentative friendship with another Lint who questions the system. As Carrington struggles with what she’d done wrong, she learns that there is life outside the walls of the city—people who don’t answer to the authorities. Then she is given an unprecedented offer to marry. Her heart is torn between feeling wanted, giving up her friendship with the other Lint, and possibly living in a nightmare. 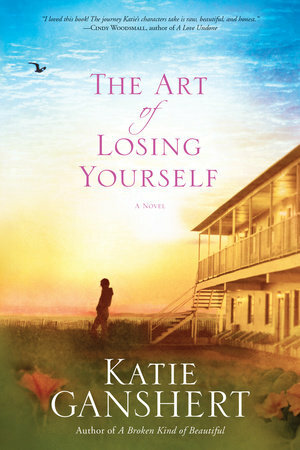 When she discovers the truth about the man she is engaged to marry, Carrington will have to make a choice. Is she enough or does she need someone else to define who she is? 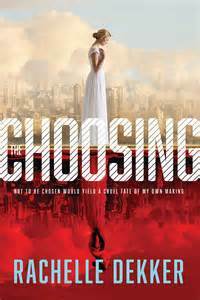 The Choosing opens at a pivotal point in Carrington’s life and takes off from there. The pace slows slightly in all of the right places in the book and allows the reader to catch their breath after certain realities are reveals. While the book is mostly from Carrington’s point of view, we do also get those of a city guard named Remko, a couple of the authorities, and a man who has taken it upon himself to mete out justice. While the mystery behind who that man is was fairly easy to figure out, it doesn’t detract from the story since the reader is most concerned with Carrington. Since this book is labeled as “A Seer Novel” and there is a little bit of an open end, I’m hoping for at least one more book where I can catch up with Carrington Hale. ****Tyndale House Publishers and the Tyndale Blog Network provided me with a complimentary copy of this book in exchange for an honest and fair review. All opinions expressed are my own.